This page allows a Citizen of the United Kingdom to purchase a Multiple Entry Business Visa for Afghanistan. Valid For: 6 months The visa validity period refers to how long the visa remains active from the time that it was issued. Please ensure that you leave the country before the visa expires. Maximum Stay: 60 days The maximum stay refers to the total amount of time that you can remain in the country during a single visit. For longer stays, you would either need to consider a residents visa or leave and re-enter the country using a multiple visit visa. 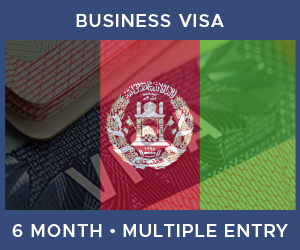 In order to apply for an Afghanistan Business Visa you will need to supply a number of items. Click on any of the icons below to learn more about each one. You will need to contact the host company to obtain a copy of their Business Registration Certificate as part of the process for acquiring this visa.